4 Tips To Protect Your Smile For Halloween — SMILE! Halloween is right around the corner and the opportunity to eat endless candy is amongst us. 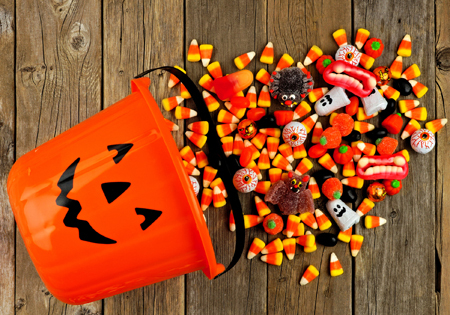 Rather than just a bad tummy ache the next day, eating too much candy can result in gradual tooth decay from all the sugar in your candy. Here are some tips in protecting your wonderful smile while still indulging in this spooky holiday! Candy such as gummy bears, taffy, candy corn and other sticky candy has a tendency to stay in your mouth longer. The longer the sugar stays in your mouth, the higher your chances are of giving tooth decay which equals cavities. Rather a good substitute would be eating chocolate. Obviously in moderation as too much of anything can be bad. Yeah you heard that right. Try eating your candy during or shortly after your meals. Saliva production increases when you eat which helps cancel out the acids that harm your teeth. This results in helping your mouth rinse away food particles. A spooky Halloween shouldn’t mean that you should have spooky teeth! Make sure you floss your teeth once a day and brush after every meal. Though eating candy is not considered a traditional meal, making sure you brush your teeth decreases your chances for tooth decay. Dentists also recommend fluoride for children as that is the best option for their pearly whites. Don’t forget to keep your smile nice & bright by purchasing one of our toothpaste. Our natural ingredients help wash out all those bad toxins and leave your teeth feeling great! We hope you enjoyed these tips! Now go have a fun and safe Halloween!